406 mm/45 Model 19153 х 3 pcs. Initial HE Shell Velocity766.5 m./s. Initial AP Shell Velocity766.5 m./s. 152 mm/50 Model 19086 х 1 pcs. 100 mm/56 B-546 х 2 pcs. 152 mm/57 MK-176 х 2 pcs. 76 mm 34-K4 х 1 pcs. 37 mm 70-K12 х 1 pcs.
. . . Firing Range3.21 km. 12.7 mm DShK2 х 1 pcs. 130 mm/55 B-2-U6 х 2 pcs. 152 mm/50 Model 19084 х 1 pcs. 37 mm 46-K4 х 4 pcs. 37 mm 66-K12 х 2 pcs. Sinop — Soviet Tier VII battleship. A high-speed battleship project, armed with 406 mm guns that were developed right before the beginning of World War I. Her advantages included well-designed armor protection and a strong secondary battery. Sinop is derived from a a 1917 naval design for a Black Sea battleship. The design was created by one of the best Russian engineers, V.P. Kostenko. It was semi-official and none of the documents were found from the navy requesting it. 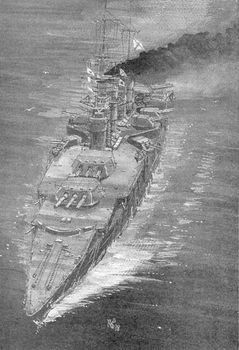 It had no chance of ever being built in the conditions of 1916-17 Russia, but shows a Russian attempt at the post-Jutland battleship. The info on it is fragmentary due to the nature of the situation in 1917-18 in the South of Russia. The ship's name is an homage to the Battle of Sinop (or Battle of Sinope), a Russian naval victory over the Ottoman Empire during the Crimean War that took place on 30 November 1853 at Sinop, a sea port in northern Anatolia where a squadron of Imperial Russian warships struck and defeated a squadron of Ottoman ships anchored in the harbor. The battle was a contributing factor to bringing France and Britain into the conflict. It is commemorated in Russia as a Day of Military Honour. 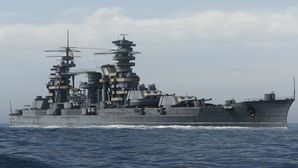 In total, four design versions were considered. This page was last modified on 21 April 2019, at 23:07.